A parade float of himself. Kevin is a bully, he’ll laugh when someone falls – he’s usually is the one who pushed the – and he’ll try anything to rub someone up the wrong way. But he choses the wrong prey and his prey finds a way of hitting back. When the tables are turned and he becomes the bullied he’ll do anything to make it stop but its not that easy. Not when everyone knows your secrets. This book was fantastic. I love books written in verse and this one is perfect as it shows the repercussions of peoples actions along with the brilliance of expressing yourself with poetry, which isn’t always about floating clouds and trees and crap. Kevin obviously bullies for a reason and whilst I didn’t want to like him, once I found out his background I could see why he was the way he was and how much his life hurts. He picks on people to make himself feel better because he doesn’t get the love elsewhere. I loved the outcome of the book and that someone chooses to take a chance on him. The book took me a grand total of about an hour to read. If that. It was fast and not a great deal happens but it was powerful even as a short book. It carries a brilliant message that I hope a lot of kids will take away with them. I loved the addition of the pages and the finally two pages were brilliant, making me laugh so much! I really enjoyed this book, it made me laugh and it restored my faith in humanity. I really do recommend it especially if you want to deliver a good message to middle grade kids who are reluctant readers. 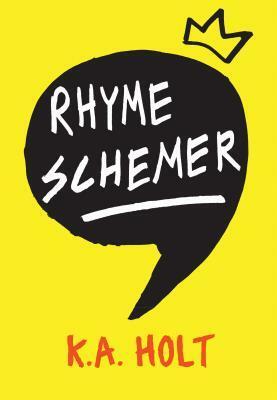 Rhyme Schemer will be published on October 1st by Abrams & Chronicle. My copy was sent to me in exchange for an honest review. This sounds really interesting! I usually steer clear of novels in verse, but knowing I can get through it in about an hour if I want to definitely makes it more appealing. Thanks for sharing!